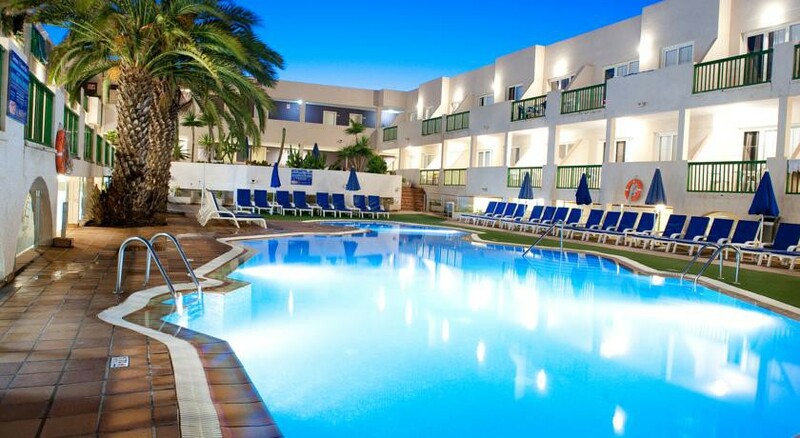 The Dunas Club Apartments is located in the popular tourist area of Corralejo on the island paradise of Fuerteventura. The apartments are around 1km from the town of Corralejo and this family friendly 3 Star complex offers well-appointed studios and one bedroom apartments. Set in a quiet location with a lovely garden and large sparkling pool there are also a host of great activities nearby. Just 10 minutes’ walk from the nearest beach, Apartmentos Dunas Club is next to Fuerteventura’s Corralejo beach and offers panoramic views of Lobos Island. The apartment complex has an outdoor swimming pool for guests to relax and there is also free Wi-Fi at the accommodation. Fuerteventura Airport is 40km from the hotel. The Dunas Club Apartments is 200m from the nearest bus stop and you can use public transport to visit a variety of local attractions including the famous sand dunes and Baku which is the only water park on the island. Less than 5km away is the Dunas de Corralejo Nature Reserve. Corralejo offers lots of options for relaxation, sports, bars, and terrace cafes, nightclubs, excellent shopping centre’s as well as pleasant areas for leisurely walks. The marina is close by as well and there are regular departures to Lanzarote and the Island of Lobos. The Dunas Club Apartments features self-catering studio apartments that can accommodate up to 3 people and one bedroom apartments for up to 4 people. All units have a full bathroom (bath or shower, hair dryer and WC), telephone, free TV, safety box (to rent), fan, iron and ironing board, kitchenette with 2 electric cooking rings, microwave oven, toaster, coffee machine, kettle, and balcony with chairs. While The Dunas Club Apartments are self-catering, there are options for Bed and Breakfast and Half Board as well. The La Luna restaurant-pub is a cosy spot that offers a delicious range of local and international specialties in a friendly atmosphere with excellent service. Guests can also enjoy the pool bar for snacks and drinks from 11am to 8pm. More restaurants and bars are just along the road from the hotel so they are easily accessible from the accommodation and the bustling centre of Corralejo is a mere 1km away. The apartment complex has a range of sport and entrainment options including a swimming pool (salt water), children's pool (heated in winter), sun terrace, gym and squash court. Nearby in the tourist resort of Corralejo, there are opportunities for deep sea fishing, windsurfing and boating. The property is just a 3-minute walk from the centre of Corralejo while the resort’s marina, where ferries leave for the island of Lanzarote, is 100m away. Hotel was very nice and clean staff were very polite and helpful.location was very good. Stayed here early summer 2018 after much research in the area, Javier and Africa made us very welcome. Our room was basic but clean and with a side sea view, complex is lovely and kept to a high standard, pool is excellent, La Luna restaurant accessible via reception. La Luna breakfast was the best we tried anywhere, great service too and right on the shoreline looking out to Lobos and Lanzarote. Dunas Club was perfectly situated for us - supermarket 2mins walk, excursions 5mins walk, restaurants and bars 10mins walk.